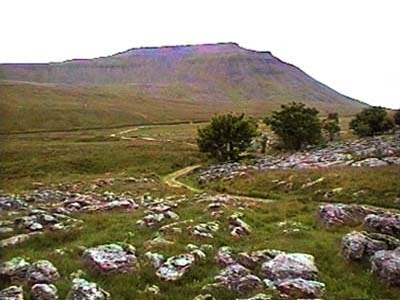 A Circular walk to Ingleborough in the Yorkshire Dales. Head along Southerscales Scars and Humphrey Bottom on the way to Ingleborough's summit. Ingleborough is one of the 'Yorkshire 3 Peaks' and affords wonderful panoramic views of Whernside, Pen-y-Ghent and out to Morecambe Bay and round to the Lakeland Hills. Parking: Roadside parking on the B6255 Ingleton to Hawes road near the Old Hill Inn (grid reference SD 744 777). The walk starts in front of the Old Hill Inn - roadside parking is available nearby. With the Old Hill Inn on your right, head along the road for about twenty yards then turn right and go through a concealed gate-type stile in the wall. Go across the field heading directly away from the wall, following a path worn into the grass heading for the two large trees. Continue straight ahead with the two trees on your right. The path meets a wall coming in from the right-hand side. Go over the stile and head straightforward in the direction of Ingleborough. Continue across this next field, over a stile and straight on following the sign "Ingleborough 2 miles". At this wall there is also signed the Great Douk Cave which is ¼ mile up to the left. If you take this diversion, return back down to this path. Continue across this field and over the next stile, where again Ingleborough is signed at 2 miles, but who's counting! The whole of this route from the Hill Inn up to the summit is part of the Three Peaks Walk. Behind now the path down from Whernside, which continues on to the Hill Inn, can clearly be seen. The path now starts to slightly snake and slowly starts to climb up the hill. The route up the seemingly near vertical side of Ingleborough can clearly now be seen ahead, but from this distance it hides the man-made zigzag path that climbs up to the top. Over to the right the quiet hamlet of Chapel-le-Dale can be seen. As Ingleborough momentarily disappears from view ahead, the path starts to get steeper and becomes a little more uneven. As Ingleborough reappears and the path flattens, there is an excellent example of a limestone pavement to the left. When the pavement is to your left, the return path down the side of a wall can clearly be seen straight ahead. The path swings round to the right, and heads straight for Ingleborough, via the two stiles in the wall now directly ahead. Go over either stile and continue onwards on the wooden boards. These boards whilst not the easiest things to walk on serve two main purposes and also make it almost impossible to get lost on this section of the route. The path preserves the ground underneath from erosion, as being part of the Three Peaks Walk this path is much used, and it also keeps you out of the bog, as the ground under this path for many months of the year can be very wet. Keep on these boards for about ½ mile until you reach the start of the steep section ahead. The path now rises steeply zigzagging up the hill mainly up man-made steps. Keep to the path until it begins to flatten then follow the path heading off slightly to the right through a kissing gate. Follow the well-defined path straight ahead up the hill, again initially following the man-made stone steps. If it is misty keep careful note of your direction of travel, as there are many paths down from the top of Ingleborough. The path skirts round the right-hand side of a rocky outcrop about two metres in height and then heads on in the same direction across the flat plateau about four hundred yards to the trig point at the top. From here there is an excellent panoramic view of Whernside, Pen-y-ghent, Pendle Hill (with a distinctive nose shape) out into Morecambe Bay and the Lakeland hills. On about the second weekend in July, Ingleton Festival takes place, part of which is the Ingleborough Fell Race. This starts at Ingleton and comes up the longer route and approaches the trig point from the opposite direction to this walk. Turn around and retrace your route back down to the kissing gate. Go through the kissing gate, but instead of heading back down the path you came up to the left, continue along the path around the top of the hill (Simon Fell). Go along this path for about ½ mile until you meet a wall. Behind there now a different view of Ingleborough clearly showing the steepness of its sides. Looking to the right of Whernside, the Ribblehead Viaduct can be seen down below. Turn left just before this wall, and head down the defined path down the grassy bank keeping the wall about twenty yards to the right. The top part of this descent is quite steep. Keep on this path until it meets a wall coming across form the left. Go over a stile in the wall and keep on in the same direction heading for the limestone pavement in front. When you reach the 90-degree right-hand turn in the wall, follow the path round the corner as it hugs the wall. Continue ahead with Whernside in the distance and the wall closely on the right. After two hundred yards, the path diverts around the entrance to another pothole, which is fenced off. The steps are visible which lead down into the entrance of the hole. Continue along the path until it meets the wall, where a familiar sign is encountered stating "Ingleborough 2 miles". Go right over the stile and on across the field retracing the way up. Go over the next stile, continue across the next field and turn left over the next stile. The path leads across the field to the right of the Hill Inn and out onto the road. Turn left and the car park is twenty yards on the left-hand side.